Georgia weather can be so finicky, we usually get cheated out of any decent spring and fall weather. With the last few days in the 70’s and nights around 50 degrees, a cold snap is headed our way. Predicted low temperatures are below freezing starting tomorrow night, until of course, we are back in the 70’s again next week. 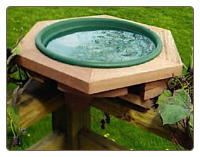 There are several bird baths in the yard, (no – make that too many bird baths in the yard) that won’t fare well in freezing temperatures. The concrete pedestal bath for one, along with the ceramic pedestal bath will definitely crack. The plastic ground bath with the dripper will do the same. 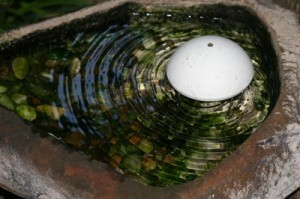 I never really understood how folks could just dump the water and turn their bird baths over for winter? Fresh water is a critical element for birds’ winter survival. When temperatures drop below freezing, most shallow pools and ponds tend to freeze, leaving many wild birds no immediate water source. 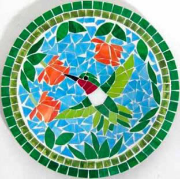 In lieu of the nearing cold snap, tomorrow’s chores include winter preparations for feathered friends, almost a bird bath face lift if you will. Removing summer bath accessories like water wigglers (shown above) and drippers like this one, and adding heaters to the baths will keep birds flocking and happy! The deck-mounted bath conceals its heater inside, so it just needs to be plugged in…yay! 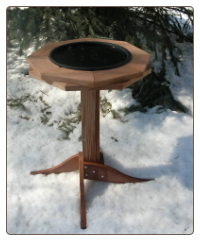 Adding heaters to your existing bird baths is one of the best ways to keep birds around. Last year our Eastern Bluebirds over-wintered, staying around through one of the nastiest winters on record. Help feathered friends to thrive and flourish during frigid winter weather by creating a wildlife-friendly habitat with a consistent fresh water source, food and shelter. With the end of summer, so comes the migration south for many song birds. A few favorites may stick around if their habitat suits them well enough. Bluebirds in my yard for example, surprised me last year when they decided to over-winter. Probably because of the juicy live worms they were offered everyday, and mostly because of the heated bird baths in the yard. This season we had three successful broods! Heated bird baths really are important to wild birds. As temperatures drop and local water sources tend to freeze over, the baths offer an oasis for drinking and bathing. Clean feathers are a must for birds to stay warm too. 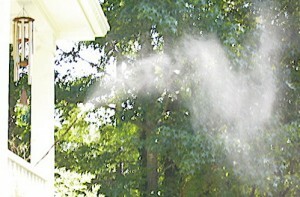 When you see them “puff up” it is a mechanism they use to retain body heat. Some folks believe birds can eat snow for water, and they can, but it takes them many calories to convert the snow to water. And these are precious calories needed to just stay warm. If you already have a favorite bath, please don’t empty it and turn it over for winter. Consider adding a heater or deicer to it for the birds. They need fresh water in winter just as much as hot summ er months. Many of the newer heaters are safe for use with all bird baths, so there’s no worry about having a metal heater in a plastic or resin bath. 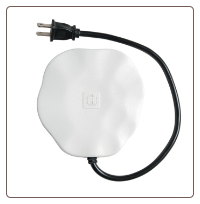 The Heated Rock for example, is an innovative new heater that’s safe with all types of baths. Mat-type heaters can be used with all baths as well. Help birds to thrive and flourish this winter by offering a consistent fresh water source with heated bird baths. You never know who may surprise you and decide to stick around? Sure, bird feeders attract wild birds, as do birdhouses. But unless you’ve added a fresh water source like a bird bath to your little habitat…you don’t know what you’re missing! 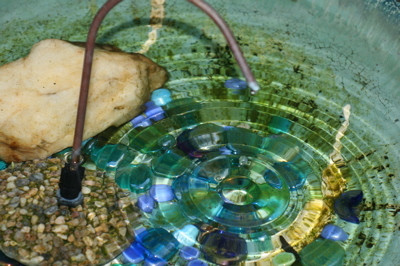 Fresh water attracts more song birds, as some may not ever frequent a feeder. 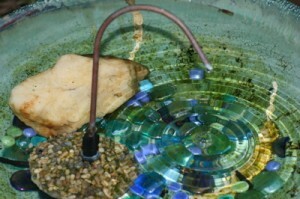 Add a bath accessory to create moving water, like a dripper or water wiggler, and you’ve just created an absolute bird magnet! 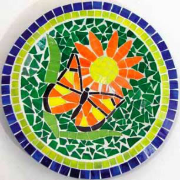 Bird Baths are available in every possible shape, size, and color imaginable. 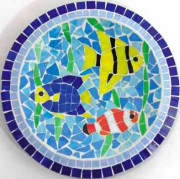 The fiberglass or resin models, resist molding and scale build-up unlike their concrete cousins. The light-weight factor makes them a breeze to clean as well. 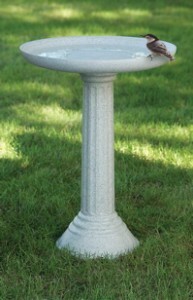 Many of these bird baths come with hollow pedestals to allow for filling with rocks or sand. This helps to stabilize the bath, and make it more sturdy. Fresh water in freezing winter months is critical to wild birds. They do not eat snow, and require fresh water for preening feathers. Dirty feathers just don’t fly right! Sometimes subtle is just better…at least in the realm of wild bird accessories and landscapes. A soothing, more natural approach may be preferred. 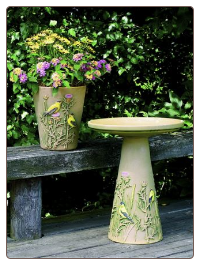 Instead of vibrant ceramic, or shiny copper bird baths, you may opt for something that actually looks like it’s part of the environment. 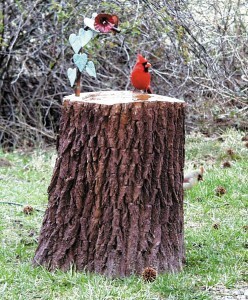 This birdbath fits the bill to a T! The realistic natural tree bark finish makes it seem like the actual landscape it adorns. 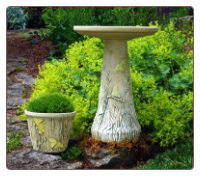 Durable molded fiberglass makes for simple maintenace too, an important factor sometimes overlooked when purchasing a birdbath. 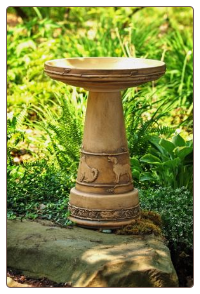 Complete with an ivy-leafy copper dripper, this bird bath will attract even more feathered friends with its gentle moving water.